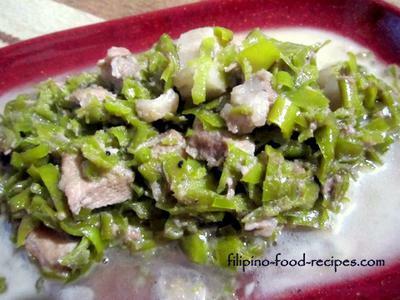 Ginataang Sili is a somewhat similar to “Bicol Express” but the main attraction here is the chili pepper and not the pork. This dish is not just “for adults only” because my 10 year old son tasted it and loved it too. Although, it has lots of the peppers, it is really not too spicy because the seeds were removed and the peppers were washed with hot water. 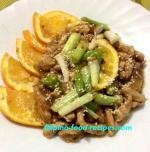 Just like the Bicol Express, I used a little pork with sautéed shrimp paste or bagoong and canned coconut cream. If you like it really hot, omit washing the peppers in hot water. Also, I suggest that you use hand gloves when handling the chili peppers, you might feel a burning discomfort on your hands, and you might accidentally touch your face or eyes. Believe me, it's not a good feeling! 1. Slice the chili peppers and remove the seeds. 2. Wash it with hot water in strainer. 3. Boil the sliced pork with 1 cup water until the liquid evaporate, then add oil, and fry the pork slightly. 4. Saute the onion, garlic and shrimp paste or bagoong. 5. Add in the chili peppers, and the coconut cream and season with salt and pepper.